This bat is not one native to the United States but rather farther south. 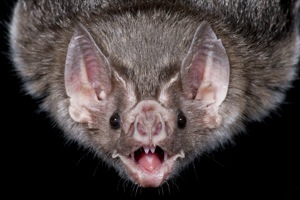 The common vampire bat weighs in at about 1.6-2 ounces or approximately 19-57 grams (a-z-animals.com). This tiny nocturnal bat has a rather round body, hair that is grey brown in color, large ears, a flat nose, and a wing span twice as large as its body (louisvillezoo.org). The common vampire bat is a rather social bat that lives in large colonies. This bat is one mammal that humans fear most. Preferring the dark, vampire bats are often times unseen and unheard. Desmodus rotundus is partially at blame for the fear people have for bats. As you can guess from its common name, the vampire bat is a blood-sucking mammal that is an important and feared member in ecosystems. Without the blood of other creatures the common vampire bat can die in as little as 48 hours (conservationcentre.org)! Because of the need for food so frequently the vampire bat is one bat species that does not hibernate (batconservation.org). The learn more about where the common vampire bat fits into the mammal kingdom check out the vampire bat's classification. Copyright Template Design © 2007 Travel Portal. All Rights Reserved. Designed by Free CSS Templates.